ଏଟିଏନ୍ନେ ଚର୍ଯାତଙ୍କ (୧୮୬୩) ଚିତ୍ରିତ, "ଚାର୍ଲସ୍ ବଦେଲିଅର"
↑ "Baudelaire". Random House Webster's Unabridged Dictionary. ↑ Clark, Carol (1995). "Notes on the Text". Selected Poems. 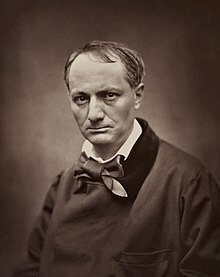 By Charles Baudelaire. London: Penguin Books Ltd. p. xxiii. ISBN 978-0-14-044624-1. ↑ Charles Baudelaire, Richard Howard. Les Fleurs Du Mal. David R. Godine Publisher, 1983, p.xxv. ISBN 0-87923-462-8, ISBN 978-0-87923-462-1. ↑ Richardson 1994, p. 110.